What you need to know about Quilty Pleasures fabric and sewing machine store in Ottawa. Quilty Pleasures, Ottawa's largest quilt shop, where the service is small-town friendly. Located in the heart of old Orleans, conveniently close to Highway 174, Quilty Pleasures offers a full range of supplies and inspiration for the creative quilter. PLEASE NOTE: WE'LL BE CLOSED ON GOOD FRIDAY, APRIL 19, BUT BACK TO NORMAL ON SATURDAY AND EASTER MONDAY. Labour (where a tune-up is not requested, or for extraordinary labour required during a tune-up) - $70/hour, minimum charge $35, plus tax. Our expert teachers will instruct you in sewing, serging and using your machine to the best advantage. Call for rates and to schedule an appointment. Everyone on staff sews, and our advice is friendly and free! Whether you're looking for that perfect fabric, specialty notion or latest book, we have everything you need to translate your great ideas into beautiful quilted projects. Authorized PFAFF and JANOME dealer, we also have an impressive selection of sewing machines and sergers to make quilting a joy. And our wide variety of classes will give you all the tips and techniques you need to make every project perfect. 50% off • Our bargain basement has full bolts all at half-price, every day. New additions are made regularly, so visit it often. 15% off • As our present to you, we'll take 15% off selected purchases during the week of your birthday. Happy Birthday to you! This discount applies to regularly-priced, in-stock merchandise only, excludes machines and furniture, and may not be combined with other discount offers. Watch for other specials throughout the year. 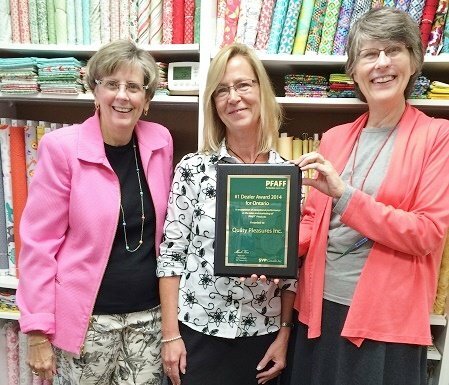 #1 PFAFF DEALER IN ONTARIO! We had a visit from our Pfaff Regional Sales Representative, Sandy Morry, and she surprised us with the #1 Dealer Award 2014 for Ontario! Of course, we feel very honoured to receive this recognition, but we have to share the credit. First of all, Pfaff makes a line of products that we love and love to promote, with quality second to none. And our customers (that's you!) know that sewing on a Pfaff is an exceptional experience, one to which they are extremely loyal. On behalf of Pfaff and ourselves, thank you for your continued support. Drop by to see your plaque! 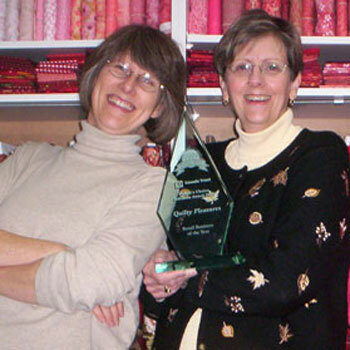 PFAFF DEALERS OF THE YEAR! We received our first 10th Anniversary present from PFAFF! We were very pleased, honoured and surprised to be named Ontario's number one dealer for 2013. Here we are joined by Mark Kerr, Vice-President, PFAFF Canada and Brenda Sutherland, our regional sales manager. 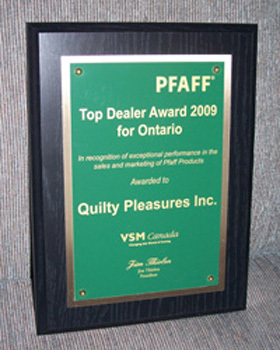 We have been named Ontario's PFAFF Ontario Dealer of the Year for 2009 and have been Outstanding Dealer for 2004, 2005, 2006, 2007, 2008, 2010, and 2011! This is a great honour, for which we'd like to thank our customers – your continued loyalty and support made winning these awards possible. We pride ourselves on customer service, because we have the best customers in the world. Thank you very much. 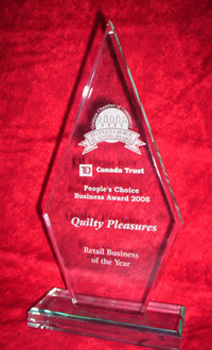 Owners Val Jensen and Leslie Burtch thank our customers for making Quilty Pleasures Orléans Chamber of Commerce Retailer of the Year 2008.